Sometimes even the error pages can't be displayed and you need to come up with a plan B. Gmail's meta-error page is simple, yet effective: Google can't always win. 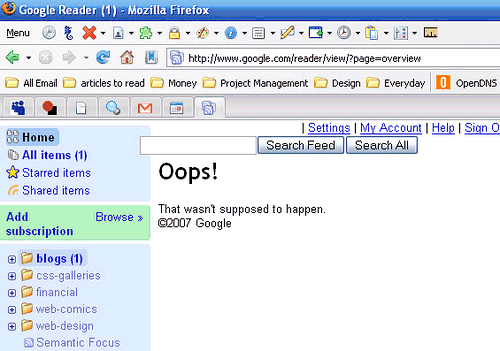 This reminds me of a similar error message from Google Reader: "Oops! That wasn't supposed to happen". I like it and that's why still in BETA. in Germany our email service is called Google Mail, not gmail. You can get your emails directly by typing in http://mail.google.com. Haha... that's funny though. Google sometimes make things light by adding fun like this... that's good. I just love the youtube internal server error. "A team of highly trained monkeys has been dispatched to deal with this situation"
This is why we love Google. Google accidentally the error page. Regarding "error page in germany", thats because gmail.de is a completely other company, and to not infringe on the trademark (even google has to obey that) the have to write like that. The second one, well, every reasonable programmer uses this error message from time to time. They aren't supposed to survive to production system though, I guess. Bad Google, no doughnut for You today! I got an error from Google Chrome a couple days ago. I don't have a screenshot but it was something like "Whoa! Chrome crashed!" As though they were shocked that it happened. In the 1960s, IBM distributed a 'beta' Fortran compiler. Fortan numbered the lines and the error listing was at the bottom i.e. ; "Syntax error in line 12" or "Undefined variable in line 23". One version listed all the errors, then stated "Note: there is an error in the error message numbering." Google always has some of the best error messages. Its, as Anon said, why we love Google. This reminds me of a Placeware (now Microsoft Live Meeting) error message from years ago. If you attempted to schedule a meeting with attendees: 1 you got a pop up message that stated (it's been so long I'm probably paraphrasing): Please select at least 2 attendees because meetings with only 1 person are not very fun. I know this isn't exactly relevant, but I did find it quite amusing. Please visit my page to see the blog. Apparently Microsoft doesn't know their own operating system. You'll see. I love this. It is great. These laughs are great. I like the Firefox one when it crashes and it says something like "How embarrassing something went wrong"
Relating back to that post about the YouTube error message, I recall that dealing with the problem correctly gets you a message that says something along the lines of "Thank you, the monkeys are happy with their bananas"
Also, I've recently received error mail messages in gmail. They're emails that are from noreply@google.com and they just say "--error--" in the title and "--error--" in the body.